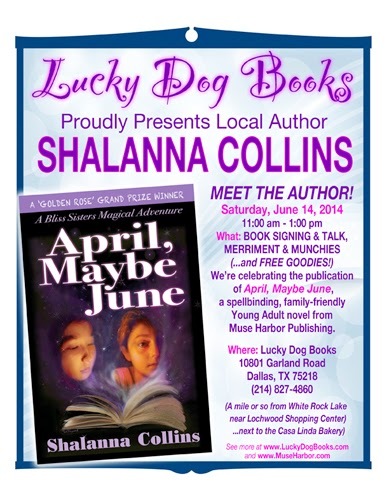 Shalanna Collins' Magical Mystery Book Tour! Launch Party-Book Signing 6/14 in Dallas, Texas! Saturday, June 14th, from 11 AM to 1 PM, there will be a launch party for *APRIL, MAYBE JUNE by Shalanna Collins*, given by Muse Harbor Publishing, held at Lucky Dog Books/Lochwood, 10801 Garland Rd, Dallas, TX 75218, 214/827-4860. We will have wine (I can't drink it, but why can't you? ), cheese tray, appetizers, and cupcakes from the best bakery in Dallas that's right next door (voted by Dallas Observer and D Magazine fans), along with entertainment including the author acting out part of a scene from the book with willing audience participants and (with luck) accompanied by interpretive belly dance troupe. Come one, come all. You'll have the chance to buy the book at a discount or WIN it. Door prizes include tote bags, T-shirts, stationery, gift certificates to Lucky Dog Books, copies of the book, a disposable (ha) video camera, and a few joke gifts. You get a ticket to the drawing just for staying to the end, and you get an extra ticket with each book you buy. Such a deal!